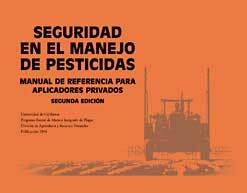 Spanish-language version of our illustrated manual for private pesticide applicators in portable PDF format. Pesticide Safety: A Reference Manual for Private Applicators, 2nd Ed. This is the PDF version of this publication, available for purchase as a download only. The file size of this document is 22MB. This manual covers information essential for anyone using pesticides on California farms, including growers, managers and employees. The book uses a farm profile format to review environmental and human safety topics. Covers pesticide labels, worker safety (handlers and fieldworkers), how to mix and apply pesticides, calibration, the hazards of pesticide use including heat related illness, and pesticide emergencies. Appendix includes sample training forms for pesticide handlers and fieldworkers. Great resource for private applicator certification with review questions in each chapter. In an easy-to-use format, with many illustrations. Some users have experienced problems using Preview® with these documents; we recommend using the Adobe® Acrobat® Reader.